To understand me as a person and as an orthodontist, one has to know my early experiences. I went to a small school, Williams College, located in a rural area. As a result, I gained an appreciation for nature and outdoor activities. I now love running, hiking, camping, and whitewater rafting. I was also very involved in music throughout high school and college: I played both classical and jazz trumpet. Finally, my undergraduate degree was in mathematics. All these interests have followed me into my professional life. Professionally, I was influenced by that mathematics degree. Before deciding to become an orthodontist, I had considered becoming an engineer. I believe my analytical skills, honed by mathematics, have broadened my approach to orthodontic diagnosis and treatment planning. In my private life, I focus on health through running, eating right, and outdoor activities. Since I live close to the office, I walk to work every day. I also appreciate the positive effects of listening to good music. This orientation extends to how I interact and connect with my patients. I see my patients as whole people, with all kinds of interests and talents we can explore together. At a person’s initial consultation, we’ll spend a lot of time just talking about his or her life; my staff and I want to know what’s important to the patient. Because I am a religious Jew, family is very important to me. I have a large, very close-knit family with quite a few children and grandchildren. I love children, which impacts my practice. While I happily care for adults, my special love is still for kids. I never raise my voice with even the most non-compliant child; here, there are only feelings of love and friendship as we encourage children to grow into upstanding individuals. I am passionate about education. After finishing my undergraduate degree, I enrolled at Stony Brook University, where I was awarded my Doctorate of Dental Surgery. I attended Columbia University for my orthodontic residency and specialty training. I have advanced experience in caring for people with facial deformities and have been part of the Dentofacial Deformities Conference at LIJ (Northwell) for more than 30 years. 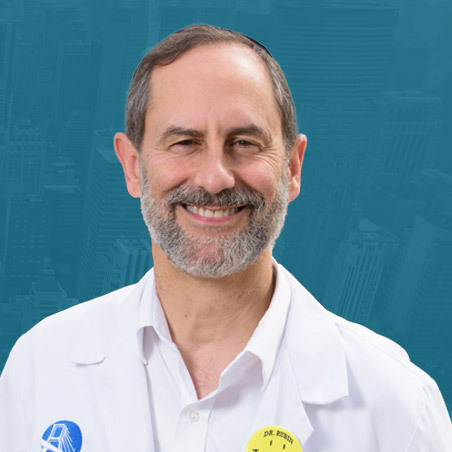 Much of my approach to caring for patients comes from my father, orthodontist Dr. Nathan Rubin, with whom I have worked for more than 30 years!